Is the Epson® EcoTank® Really Worth the Money? The high price of ink has been a source of frustration for many printer users. Last fall, Epson® switched things up with the release of their EcoTank® series, a continuous ink system printer that hopes to shake up the print industry and get people to reconsider their relationship with ink. What we’ve found is that depending on your printing habits, the savings may not be all that remarkable. Like other Epson printers under the Workforce® umbrella, the EcoTank series features a few different models, each with varying price points and features. The ET-2550 series is intended for the average home user and includes enough ink to print up to 4,000 black pages and 6,500 color pages. Epson sells the machine for $299.99 and each ink tank sells for $12.99 each. On paper the ET-2550 seems like a very enticing option and for the right customer it might be. But if you only print occasionally, the overall cost savings is minimal. A recent Consumer Reports survey found that the average user prints 23 pages of text, nine pages of graphics and about nine photos per month. After testing the 2550 against similarly classed standard inkjet printers, they found that the cost savings of the EcoTank only begins to add up after five years. Most consumers replace their machines after a couple of years, and due to the newness of the series, the actual longevity of the EcoTank series remains to be seen. If you print only a few times a month, you are better off paying for compatible ink cartridges as needed. The price of most compatible ink cartridges is on par with the Eco Tank series, allowing consumers the freedom to spend money on ink as they need it, rather than paying for the printer and ink upfront. As the printers in the EcoTank series get more expensive, the savings become considerably more suspect. The Ecotank WF-R4640 is designed with the small business owner in mind and at first glance, its print capabilities are compelling. 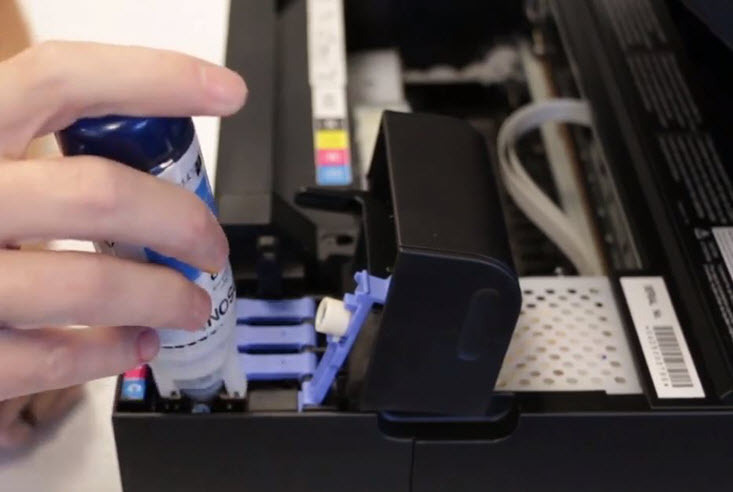 Instead of the ink tank system, a black and a color ink pack is included with each printer. Every bag has enough ink to yield 20,000 pages per color, a competitive value for any business oriented machine. The savings get murky when you start comparing the upfront cost of the machine and consumables to a comparable, but far less expensive Epson inkjet. Action Intell notes, in terms of features, the standard (non-EcoTank) functioning WF-4640 is incredibly similar to the EcoTank WF-R4640. 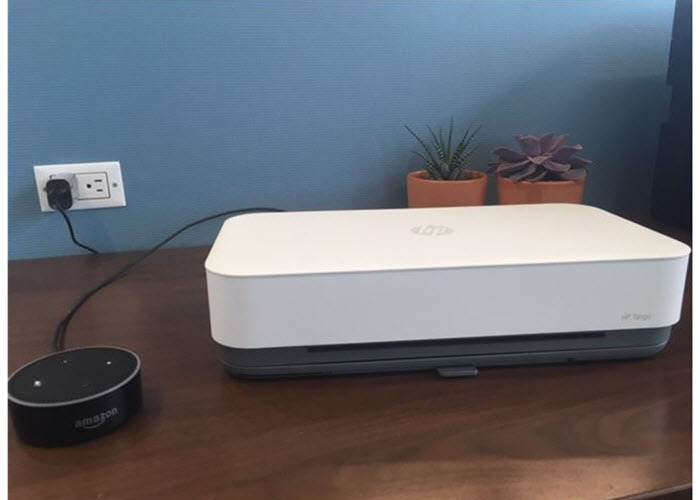 Both have the same print speed and identical print, scan, and fax capabilities. Other than the ink system, the main difference is the price tag. 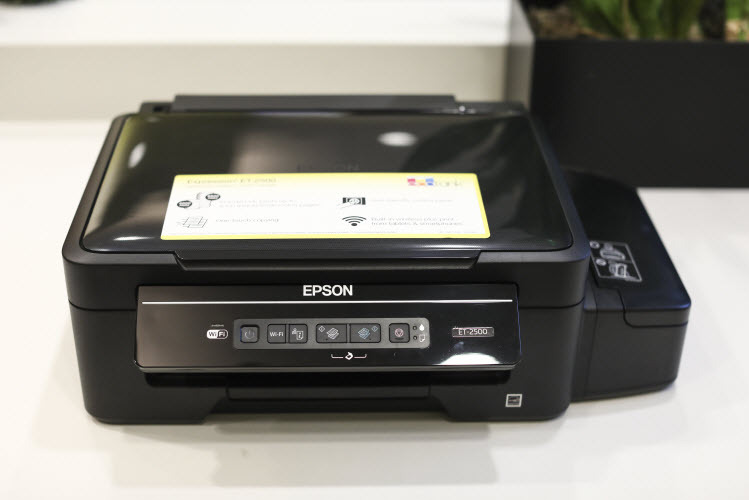 The EcoTank sells for $1,199.99 while the standard WF-4640 is only $249.99, just on printer price alone you would already be ahead $950 sticking with a conventional Epson Workforce. Bring the cost of ink into the fold and the cost of the EcoTank continues to add up. The EcoTank’s 20,000 page high yield black ink bag costs $179.99, and each color goes for $99.99 apiece. 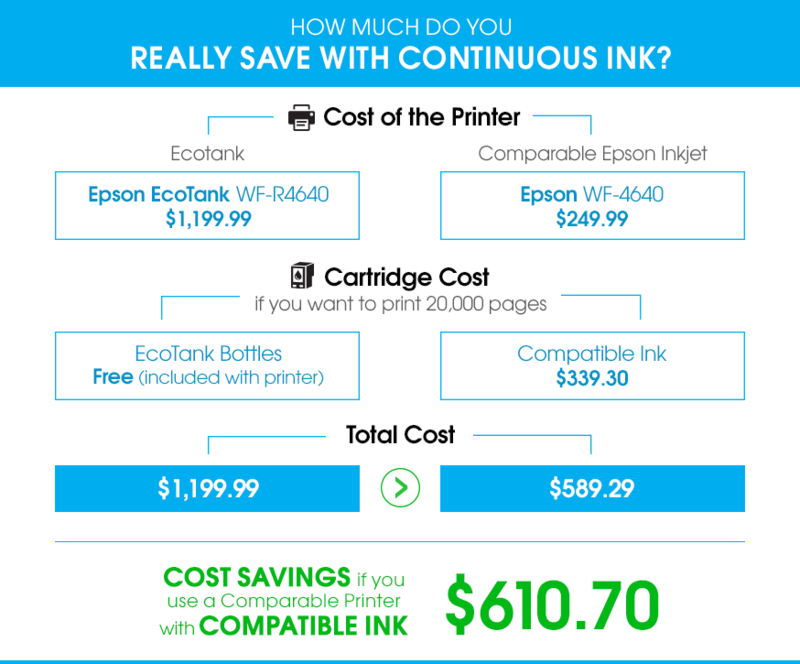 We did a bit of math to figure out what the cost would be for a compatible cartridge if you wanted to match that same 20,000 page yield offered by the EcoTank, and the savings on compatible ink is significant. If bought in a bundle, a 2,600 yield compatible black ink cartridge costs $9.00*. You would need to spend around $69.30, or buy 7.7 compatible cartridges to match the 20,000 page yield offered by one black EcoTank ink pack. Each compatible color cartridge also goes for $9.00 when bought in a bundle, and yields 2,000 pages. You would need to spend $270 to buy the 30 color cartridges needed to match the 20,000 page color ink pack. When all is said and done, if you look at the total cost of the EcoTank printer alone ($1,199.99) and subtract it from the total cost of a new WF-4640 printer ($249.99) plus the number of cartridges needed to give you a yield of 20,000 pages ($339.30), you would be ahead $610.70. We’ve broken down the math for each cartridge in the chart below. For some business owners, the EcoTank series simply may not be worth the money. If you really crunch the numbers, you can buy 60,000 pages worth of compatible ink sticking with a conventional Workforce before you break even on the EcoTank. (339.30 x 3 =$1,017.90). In general, new technology like the EcoTank series is promising. Manufacturers are slowly moving away from usual razor-and-blades model that’s dominated the printer market for decades, and ink tank system printers could be the new normal in a few short years. For now, a cheaper printer paired with compatible cartridges is still the best choice for most. 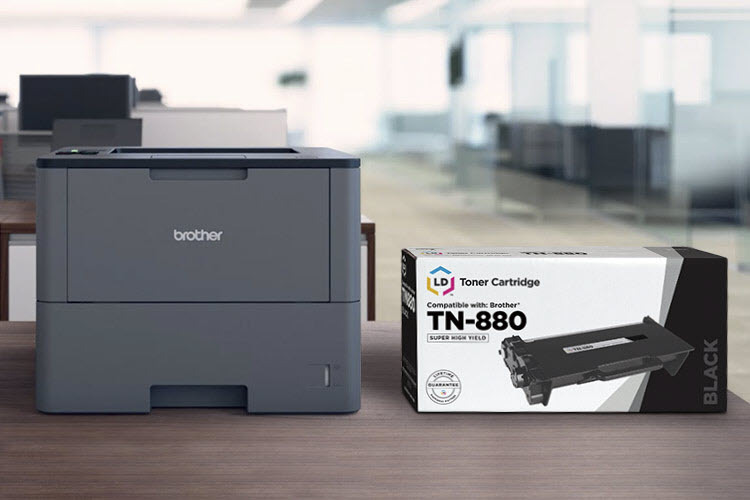 But with other manufacturers like HP® and Brother® coming out with similar ink tank systems shortly, it will be interesting to see what sort of impact continuous ink will have on the market. No matter what printer you choose to go with, always scrutinize the cost in the long term. 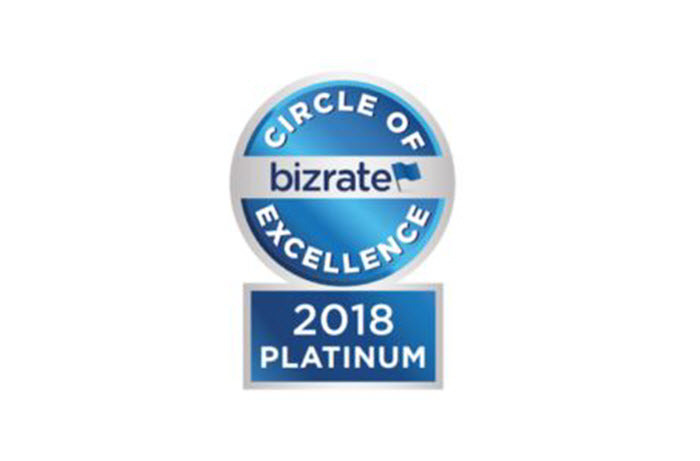 Print manufacturers are quick to sell you their latest and greatest machine but if you peel back that new coat of paint, the innovation and overall cost may be underwhelming. *Savings based on price comparison between remanufactured/compatible cartridge prices and printer brand (OEM) cartridges effective as of March 1, 2016 on www.LDProducts.com. OEM names are registered trademarks of their respective owners and are not affiliated with, and do not endorse LD Products. I refuse to buy ink from HP. They covered up the fact that their last printer they sold me used color ink even when printing black only documents! 90% of their color ink jet printers do that. They won’t admit to it unless you get the right customer service rep that “let’s it slip”. They even denied this when I called them prior to purchasing their ink jet printer. They make you buy regular color ink jet ink even if you don’t print color documents that often!! LD needs to let people know this fact. I love LD as they are selling ink at a reasonable price and they don’t deceive people about their product. Buy your HP printers from Amazon used by third party sellers fully warranted then use only LD ink. Lol.. every printer does that unless you specifically tell it to print in greyscale. I’m convinced that HP has updated software on select machines to completely not function if replacement ink is used. I printed 300 pages yesterday without issue on an HP 8625 only to have an error message today indicating that my cartridges are damaged and need replaced. Mind you, this printer printed clean pages of printer status report between error messages. Moving my business to Epson today. Totally correct – and putting in one HP ink magically fixes everything – ripoff! Alan is right on! HP does indeed require you to buy both a black & white & a color Carthage even if you never print in color as the ink sells as a set only. I say FOUL! And dirty foul at that. I’M looking for another brand printer now. It won’t be a Kodak as that was the worse printer I ever owned. Epson looking better all the time. I got my eco tank printer for free so all I have to buy(after I run out) is ink bottles and they are cheap so I am ahead” I love my eco tank printer and with kids in school it gets a ton of use. epson 4550 love it 2 years and 40 k pages later …. cheap to operate …. Epson RT 2550, for the most part is ok. I did not like the fact that at the end of the life ink pads, you most send your printer to their tech guy ( and of course almost 2 hours away) because even though I replaced it myself, the machine will not reset and start printing. Come on, is suppose to help people like me trying to save and send kids to college save… no have in the future more expenses…. I think they should have key to reset your printer. Anabel…what do you mean “the end of the life ink pads”? im looking at Epsons and don’t want to have to take it to a tech guy for things like what you addressed but don’t understand what your talking about.